This week I found myself working in the Czech Republic capital of Prague. It was a trip down memory lane. I was there during November 1989 when the Communist regime fell. It was brought down by a huge popular uprising driven by the Civil Forum movement led by the playwright and dissident Vaclav Havel. I was reporting on these events for the BBC. 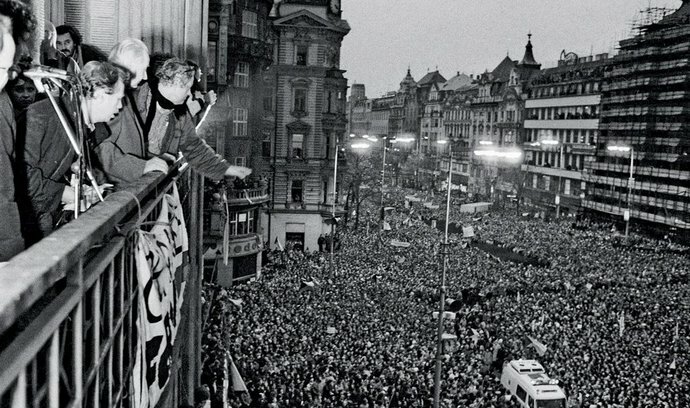 During my visit this week I returned to Wenceslas Square where, during those days when the people rose up, hundreds of thousands gathered to demand freedom for the country and its people. While revisiting the square, I spent an hour or so searching for two balconies. The first was the spot from which I presented the Six o’clock News on BBC Radio 4 on the evening that the biggest demonstration of them all took place. Earlier that afternoon I entered a block of apartments on one side of Wenceslas Square and managed to persuade the owner of one of the apartments that overlooked the square to let me use their balcony for a couple of hours. They agreed. I think the name “BBC” swung it. The crowds gathered in their thousands and it was a thrilling experience to broadcast live from that balcony, sensing that this popular uprising was about to topple the regime. (Only a few weeks previously I’d witnessed the same thing happen in East Berlin). Having relocated the balcony and glanced up at it with fond memories, I then went off in search of another balcony. This was where the leader of the uprising Vaclav Havel and the man who inspired the 1968 Prague Spring, Alexander Dubcek, addressed the crowds. Having done my bit of broadcasting from the balcony, I made my way through the crowds (it took ages because there were so many demonstrators) to take up position beneath the balcony where they were speaking. After they’d addressed the crowds I managed to get inside the building and interview them both. Trying to relocate this balcony during my visit this week was a bit of a struggle. Firstly, trees have since been planted around the periphery of Wenceslas Square, shrouding the front of most of the buildings. Secondly, the buildings themselves have changed. Starbucks and McDonalds have arrived. I had trouble locating the exact balcony where Havel and Dubcek addressed the masses. A colleague who was accompanying me this week turned to Google Images on her smart phone and called up this picture, showing the two leaders addressing the crowds from the balcony in question. We searched the front of the buildings in Wenceslas Square, comparing their façades to that in the photo. “Is that the same church in the background?” I asked. “Yes,” said my colleague. “The wall alongside the balcony also looks the same. We’ve found it”. The colleague in question, Ann Bird, is clearly a better investigative reporter than me! Anyway, we had pinned down the second balcony! I would have loved to enter the building itself to ask residents if they had any memories of that historic day. It looked to me that the apartments on the upper floors were rented out to foreign tourists and the bottom part of the building is now a branch of Marks & Spencer. I didn’t have time during my return visit to go back to the Magic Lantern, a small theatre a short distance from Wenceslas Square that, in effect, became the headquarters of Civic Forum and was where they held all their regular news conferences, which were packed. One of the most amusing memories I have of that time is how the Civic Forum leaders used to have regular back massages in the basement of the theatre. Clearly they were feeling the stress of leading a popular uprising! One day I waited outside the room where Mr. Havel was having a back massage until he was finished and I could interview him. I remember him well. He was one of the most likeable people I’ve interviewed and a towering figure during that crucial period of history.